Alpine milk chocolate with hazelnut cream. 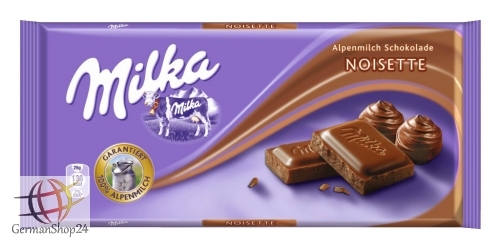 Milka Noisette is a delicious chocolate delight with a creamy and nutty hazelnut cream filling. 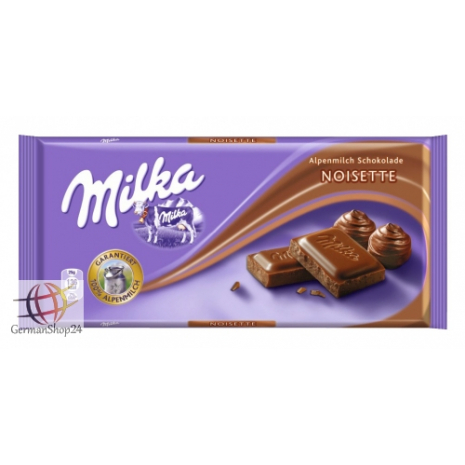 Irresistibly silky in texture and a true delight for all chocolate lovers. 100g / 3.53 oz NET. WT. Sugar, cocoa butter, HAZELNUT PASTE (13%), SKIMMED MILK POWDER, cocoa mass, SWEET WHEY POWDER (from MILK), BUTTERFAT, emulsifier (SOY LECITHIN), flavoring. Cocoa: at least 30% in the milk chocolate. May contain traces of other nuts and wheat. Zucker, Kakaobutter, HASELNUSSMASSE (13%), MAGERMILCHPULVER, Kakaomasse, SÜSSMOLKENPULVER (aus MILCH), BUTTERREINFETT, Emulgator (SOJALECITHIN), Aroma. Kakao: 30% mindestens in der Alpenmilch Schokolade. Kann Spuren von anderen Nüssen und Weizen enthalten.